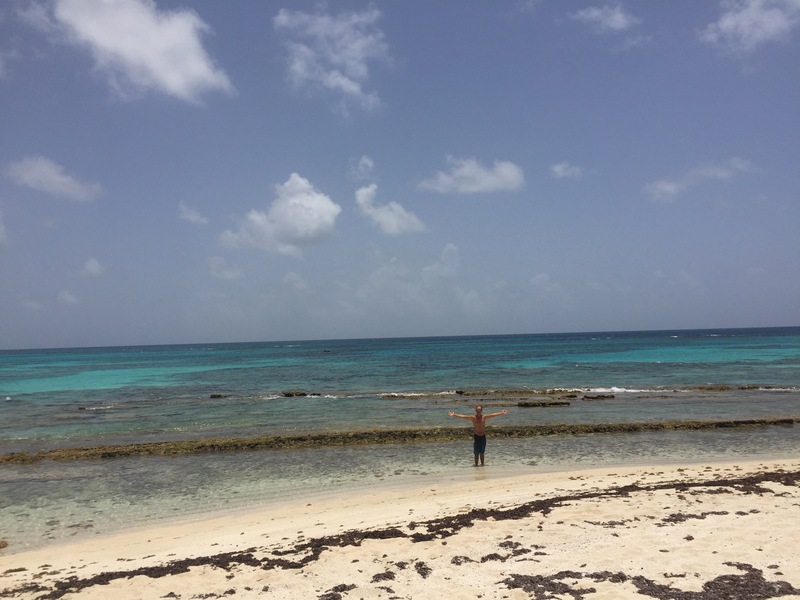 We really enjoyed our time on Buck Island and had we known it was so gorgeous and serene, we would have stayed, but we had a good weather window and wanted to head to Bonaire. It is about 425 miles from anchorage to anchorage which should take us about 2.5-3 days depending on the wind and waves. When we look at good weather windows, we are looking at sustained winds of about 15-18 knots, 1-2 meter seas with 7-8 seconds intervals between each wave. 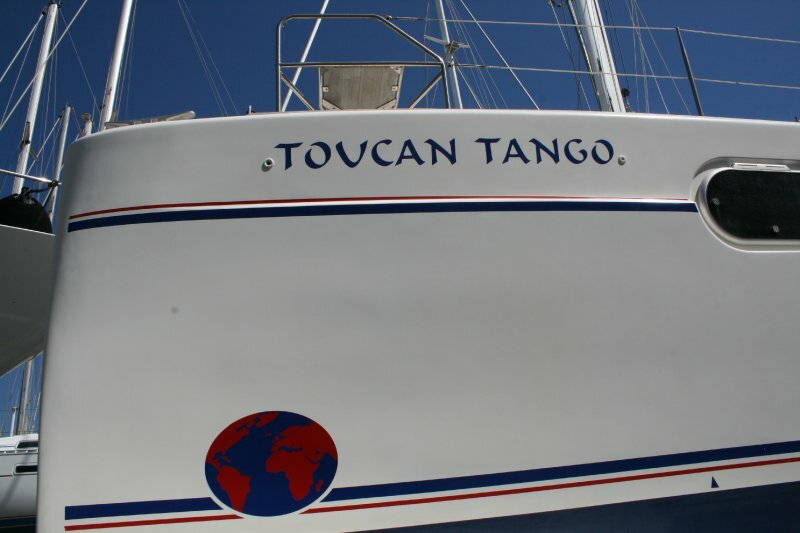 This makes it a comfortable sail for our boat. The weather looked to match our desired conditions except about 200 miles in there were gusts predicted over 30 with 3+ meter waves in short intervals, which is not pleasant at all. But at some point you just have to set sail and go and that is what we did. 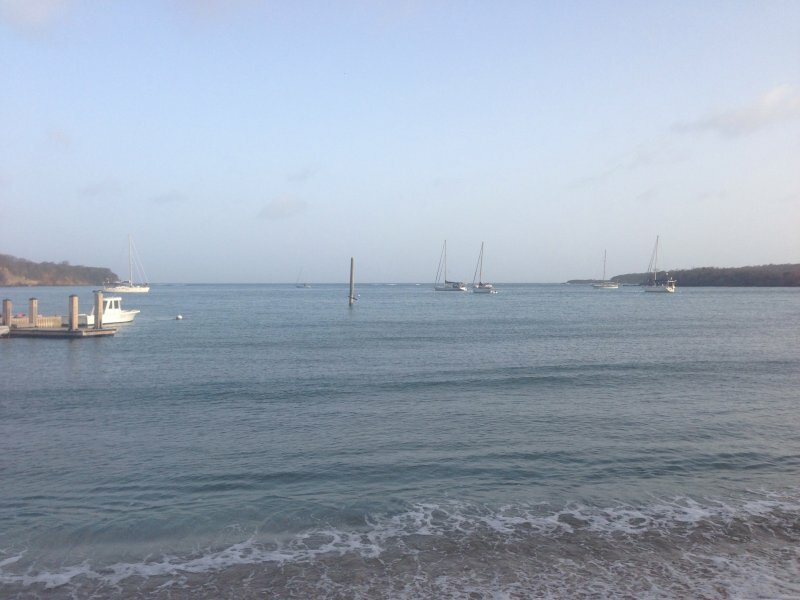 We left our pretty little anchorage around 530am-545am and motor sailed in between Buck Island and St. Croix which was about 4-5 km (nautical miles). 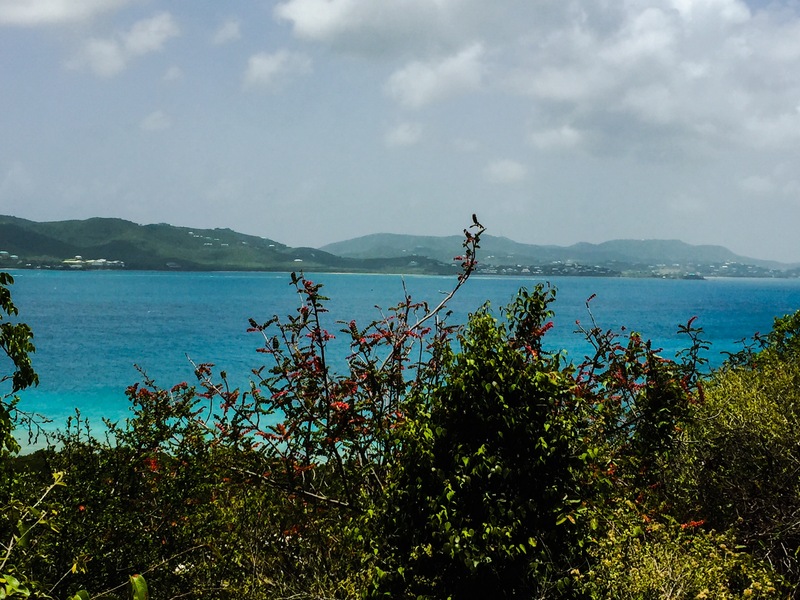 Once we hit the tip of St. Croix our 400-mile clock started to count down. Matt likes to set courses “as the crow flies” which can take you over islands and through passages that are not sailable. 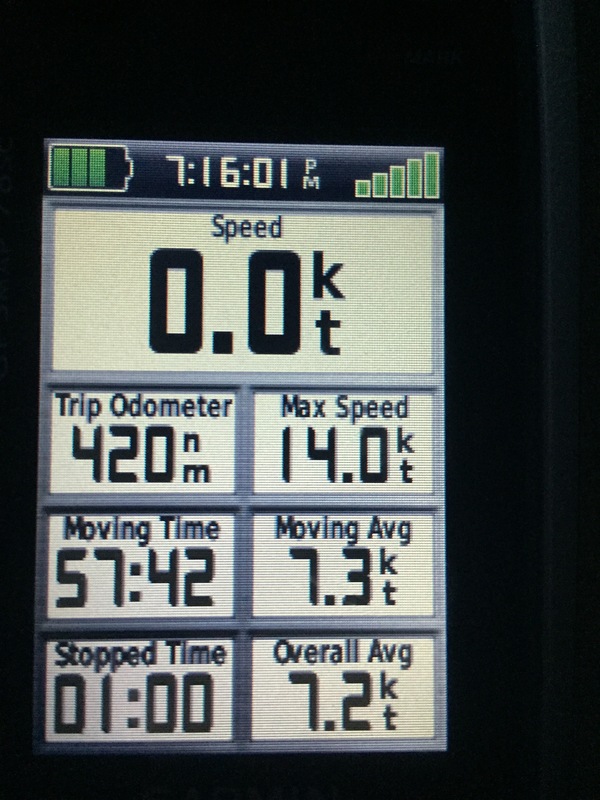 So, we sailed more miles than indicated by either of our GPS units (all 4 of them on board). 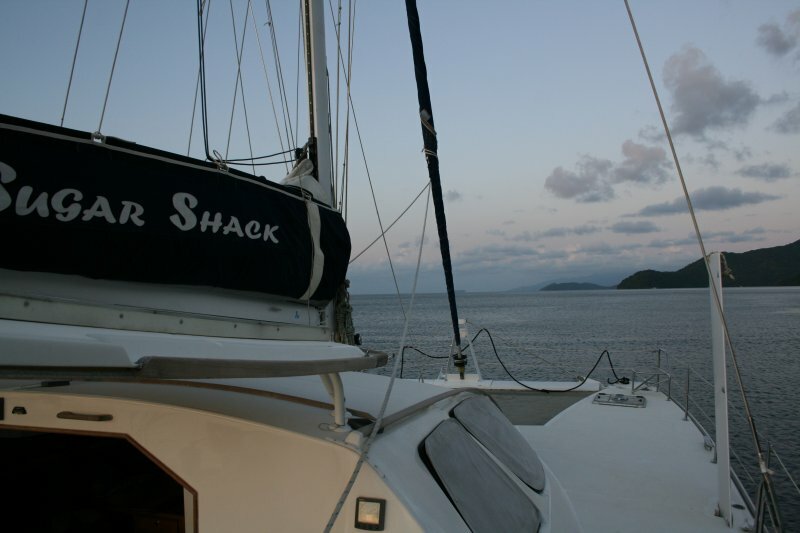 Matt and I have not been on a long sail since we crossed the Atlantic Ocean bringing Sugar Shack from the Canary Islands to St. Lucia which took us 18 days and 3,000 miles. We did several other overnights together but usually those were around 150-200 mile stretches. Wayne had never done an overnight on Sugar Shack and this was his first big crossing – so lots of firsts on this adventure. Winds were light so we motor sailed for the first few hours, but as the winds picked up we were able to shut down the engines and just enjoy the sound of the sea. We lost sight of St. Croix within the first 40 miles and then there was nothing but a big blue watery road surrounding us. In the late afternoon, a squall formed to the left of us and even though we did not get her in path, we were rewarded with a double rainbow. We did not see any living creatures (birds, fish, planes, etc…) until late afternoon when a pretty little white butterfly began to flutter around. Where the heck did she come from? How did her little wings bring her so far off shore? I offered to give her a ride and she declined. But, shortly after, two scroungy black birds (could not identify them) started hovering by the boat, one tried to land on the bow but decided against it and flew away. 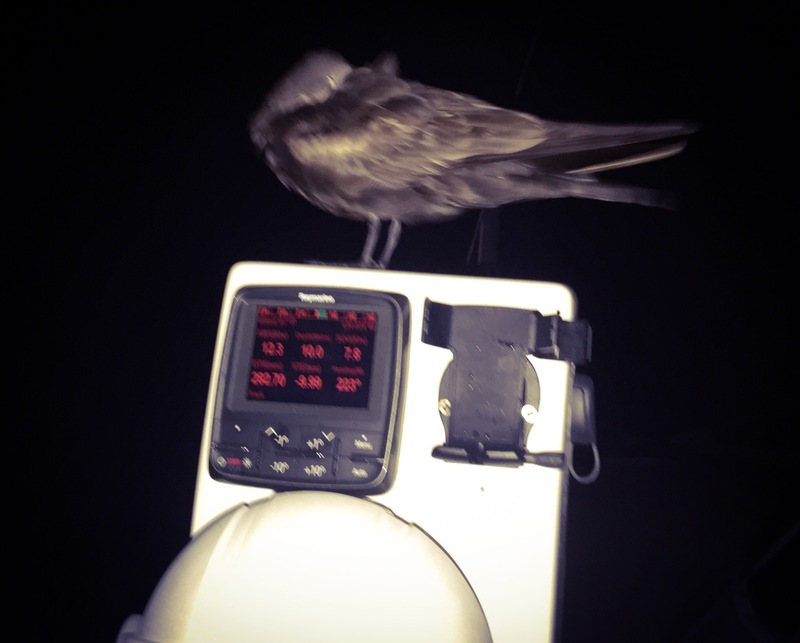 However, the other landed on the port helm station and called it a day. She stayed with us all night and into the early morning for almost 70 miles. When daylight came, Matt shooed her away because she had pooped all over the deck – that’s the thanx we get for giving her a lift. Crazy hitch hiker – rode with us for 70 miles. We had already decided on shifts, Wayne was to take the 6p-9p shift, Matt 9p-12a and me 3a-6a. I have issues when I can’t see the horizon so the first shift was out for me. 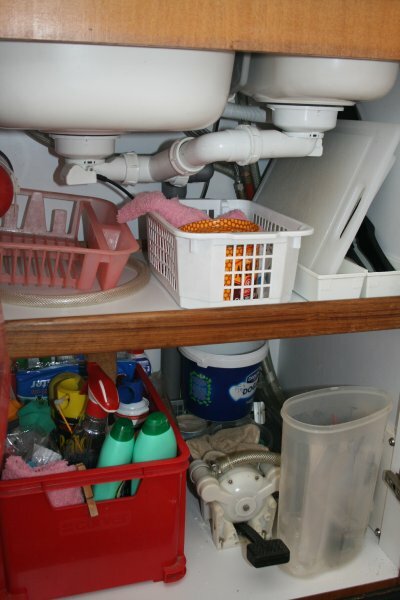 Then the shifts rotated through the next day. 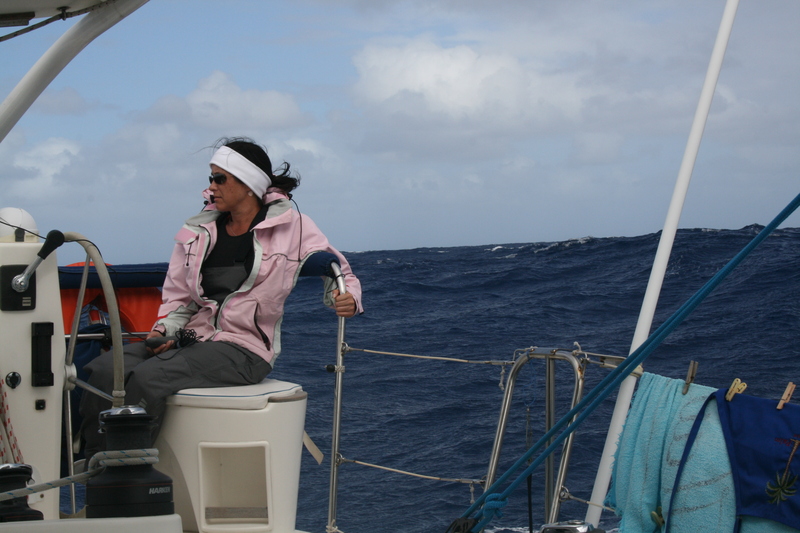 After dinner, we had to turn on the engines as the winds were leaving us, so our night sail became a motor sail. I quickly hit the sack and my internal alarm clock woke me up just in time to get some warm clothes on and start my shift. The boys had reported an uneventful night so far. As most of you know, if anything is going to go wrong it will be between 2a-3a in the morning. Never fails, always get some sort of excitement around that time. During my shift, I listened to music, watched the phosphorescence which I love, and enjoyed the starry night. Matt was up and down because the man can’t sleep on crossings, but for the most part it was really peaceful being out in the water, all by yourself surrounded by such beauty! But, all good things must come to an end. As I was transitioning the watch to Wayne, a dark ominous cloud formed and not 15 minutes later, we wind kicked up to 30 and the rain started. 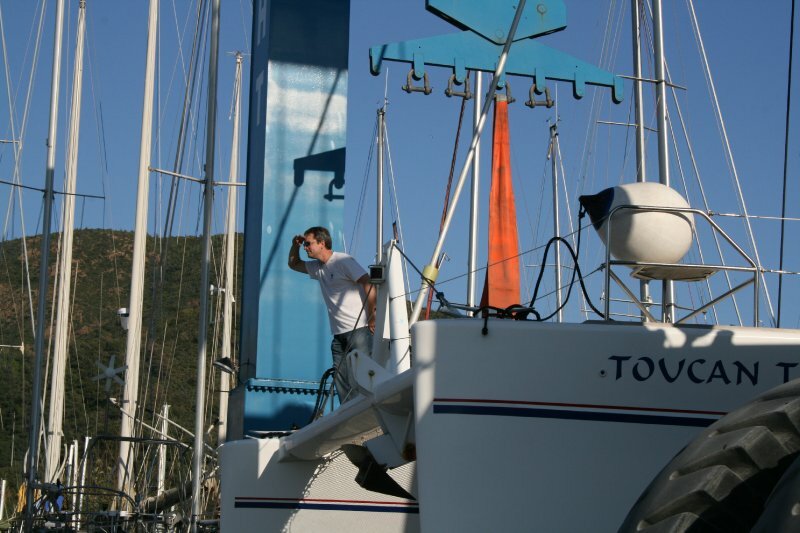 Wayne quickly headed down 30 degrees while Matt centered the main and doused the jib. It did not last long, but thanx to quick thinking we were back on track 15 minutes later. 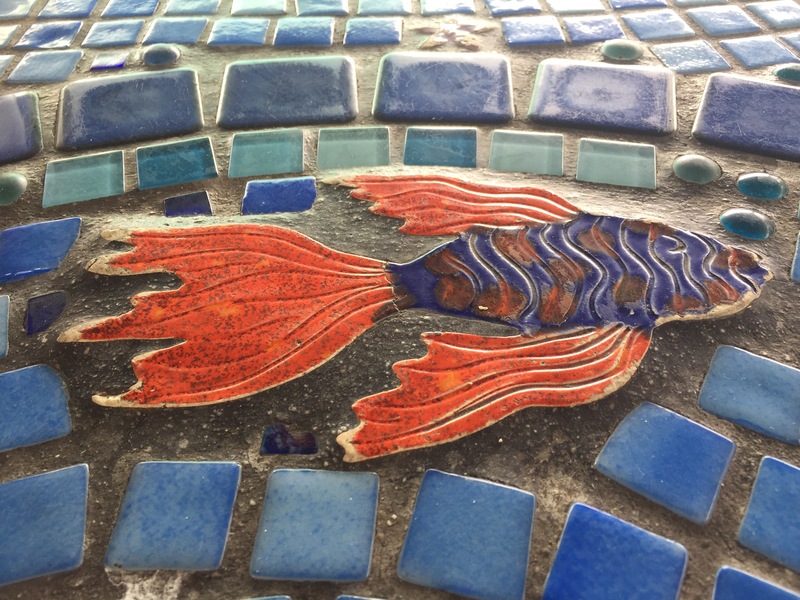 Day 2 was uneventful – yeah! 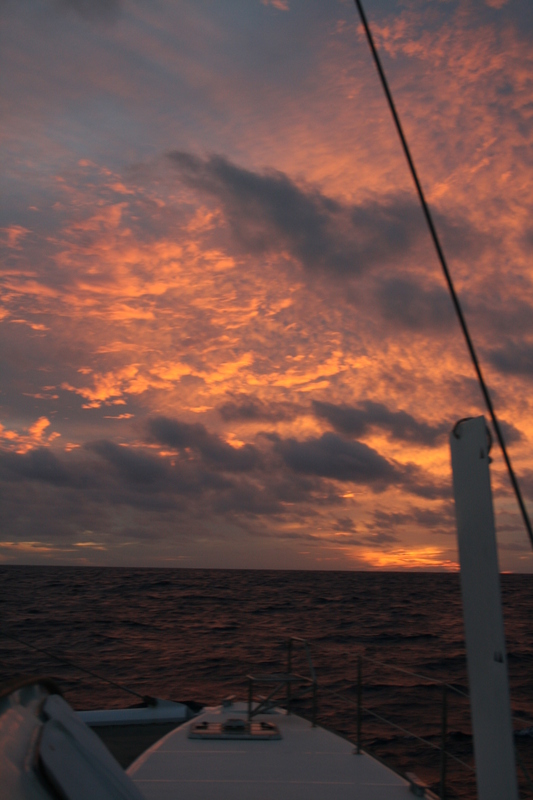 We sailed almost the entire day without engines, read books/magazines, and held our course. Due to the inconsistent sleeping patterns, we all tried to catch a few extra zzzz’s during the day. Matt created feasts for lunch and dinner and our night shifts started again. As I sat at the helm at 2am, with both boys asleep, and “Alive” by Shia playing in my ears, I gazed down toward the phosphorescence and could not help but be inspired. I love these little guys and wanted so badly to capture it on camera—but it just did not work. Then I wanted to jump in and be covered by all their glory – would they light up in my hair? Would they make me glow? Would I feel like a princess with these amazing little creatures around me? Surely it was the sleep deprivation talking as a swim in the middle of the ocean, at night, in pitch black, with the boat moving at 9+ knots is not a good idea. But, then I thought, why do we as humans always want to capture beauty rather than just enjoy it (why do we feel the urge to pick the prettiest rose)? Maybe because I am not sure I will see them again or because they make me feel so special, but I so wanted to capture their beauty and share it with you. Top speed of 12.8 (from the day before). It was pretty darn exciting to go to bed at 7p knowing that when I woke up for my 12-3 shift we would be arriving later that day. When my shift began we had 108 km to go and when it ended we were at 84 km left. I crashed after my shift and woke up 3 hours later with about 60 km to go. We would arrive during daylight and we were all thrilled! We were also blessed with several dolphins swimming at the stern – strange as they normally like to swim at the bow. They did not stay with us very long, but we sure did enjoy watching them. 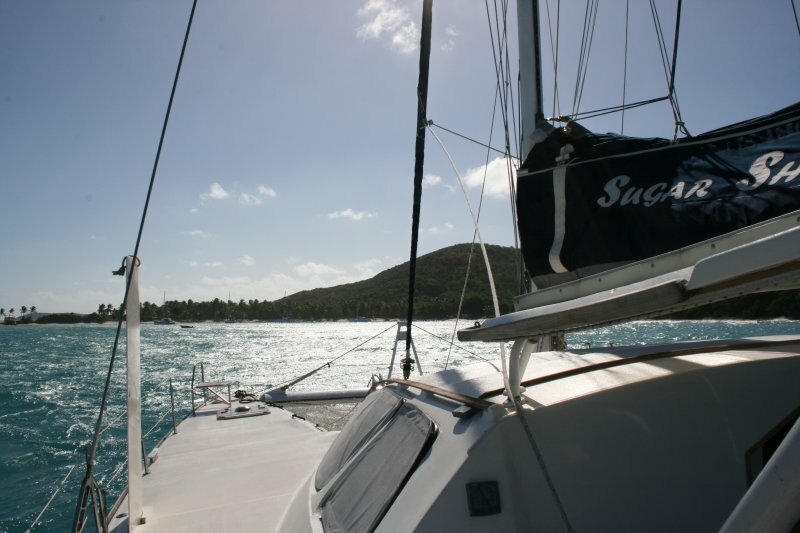 We arrived on the East side and went around the North side of the island to get to the one mooring spot. The entire island is a National Marine Park so you are not allowed to anchor anywhere near the island and frankly, it is too deep. We easily spotted the marine field where 20 of the 40 moorings were already taken. We knew the moorings belonged to the Harbor Village Marina, but first we needed to visit the police station to let them know we were here. They were super helpful and said that we all could come to shore even though we have not officially cleared into the country (Customs and Immigration were closed until Monday morning). 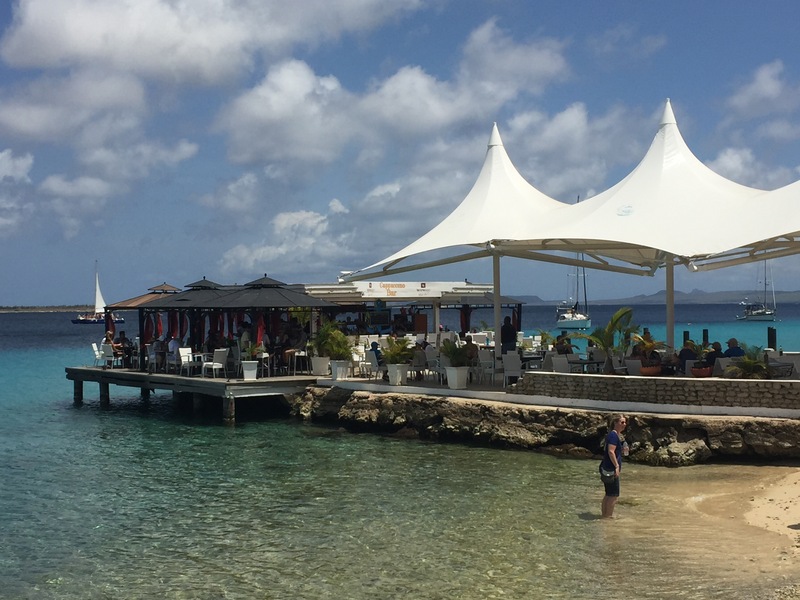 We then took the dinghy by the marina but they were closed too – so we showered and treated ourselves to a nice dinner at Karel’s Bar, right on the water, overlooking the entire bay. Trip Computer – good trip! This entry was posted in Aruba, Bonaire, Curacao, Virgin Islands_U.S and tagged abc islands, bonaire, buck islands, cruising, living on a boat, passage, U.S. virgin islands, usvi on June 27, 2017 by Christine. With our issued permit, we headed out early to Buck Island and we could not help but wonder if it was named after the naked tourists or deer (surely there are no deer on this tiny uninhabited island). It was less than an hour journey so we motored into the clearly marked channel and dropped anchor in 2 meters of water. We arrived before the day charters invaded this peaceful place and it was beautiful. 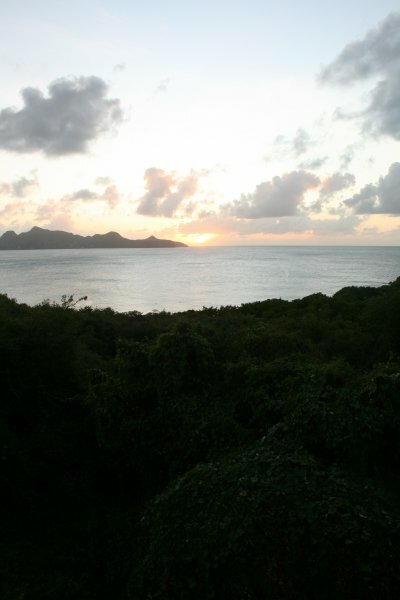 Buck island is really small and designated as a National Historic Monument. There is a walking trail and a snorkeling trail. Slowly, the day charter boats started to arrive, so we decided it was time to swim ashore and begin our hiking adventure. 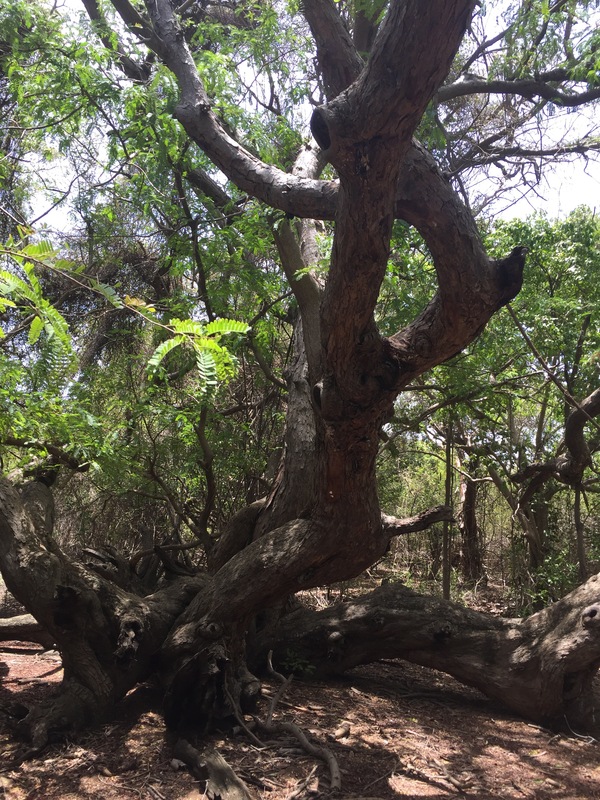 The hike starts at West Beach and takes you on a pristine trail through the canopy of trees to the observation point and then back down to Diedrichs point. Canopied tress cover most of the hiking trail. Isolated beach with lots of reefs and coral up to the sand. View on our hike – so pretty! 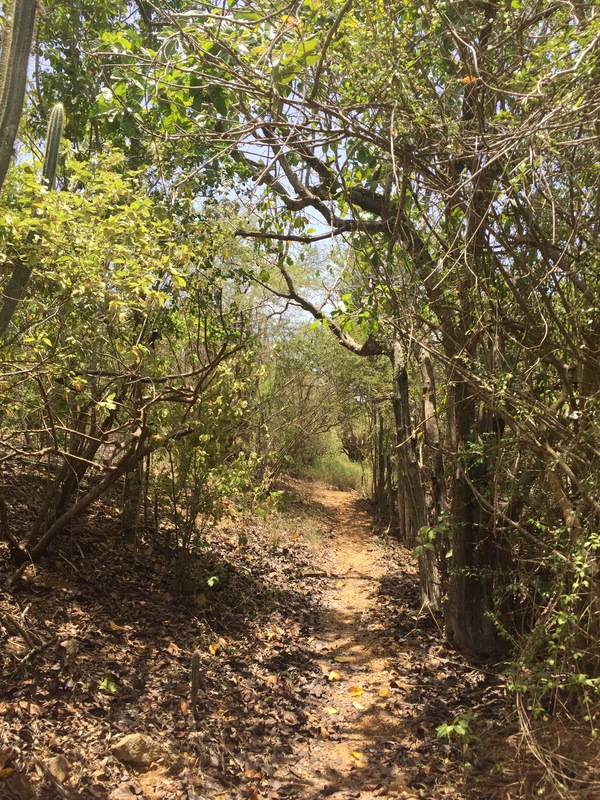 There were tons of birds, butterflies, and lizards to greet you along the way. All in all the walk was pretty easy, clearly marked, and fun to do. It probably took us about 1.5 hours there and back and that included a dip in the ocean to cool down. Twisty tree that begs for you to sit under her cover. Very serene. We made it back to Diedrichs point – YEAH! We swam back to the boat for a snack and packed up Sweet N Low for our snorkel adventure. 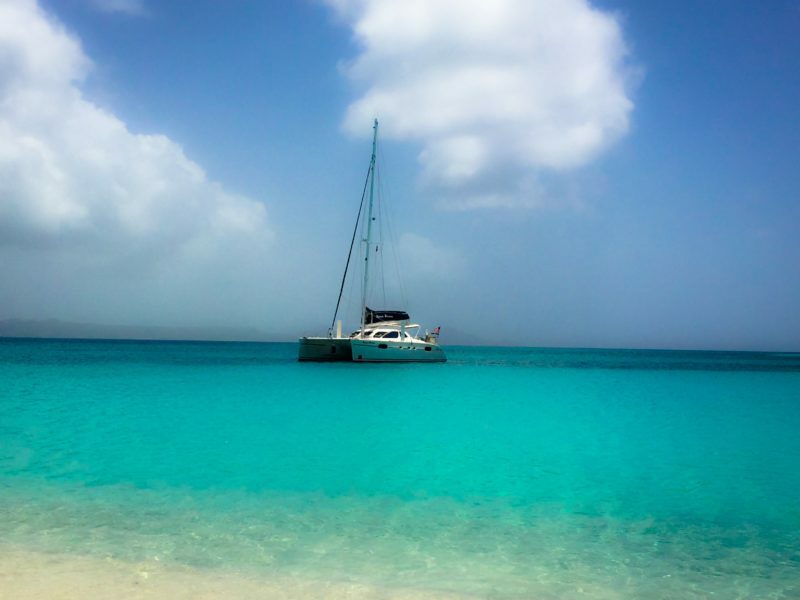 There is only one spot we could anchor Sugar Shack which was off West Beach and the snorkel area is on the other side of the island. Our boat was too big to take her directly to the snorkel spot, but Sweet N Low fit perfectly. We arrived before everyone else and quickly jumped in. Wayne went left and Matt and I went right (not sure why we didn’t stick together). This was by far one of the prettiest reefs I’ve seen in a long time. It was alive with coral, schools of all sorts of fish (purple tangs, blue tangs, etc…), home to some of the largest parrot fish we have ever seen, and only about 15-20’ deep.. About 5 minutes into our snorkel, I noticed this pretty little white fish with an aqua blue strip down both sides of its spine. This cute little fish followed Matt ad I during our entire snorkel. Close enough to be with us but far enough away that Matt could not touch her. It was like having our own private tour guide. After about 45 minutes to an hour we met Wayne back at the dingy where he told us about the grotto and signs. What? We missed that, so we hopped back in the water and checked out all of the underwater signs about the coral and sea life in that area. We also explored the grotto which was a tide pool with its own entrance and exit. Inside here it was a little more protected, but just as beautiful! One of the best experiences I’ve had for shizzle! Buck Island. The yellow areas is the designated anchor area. 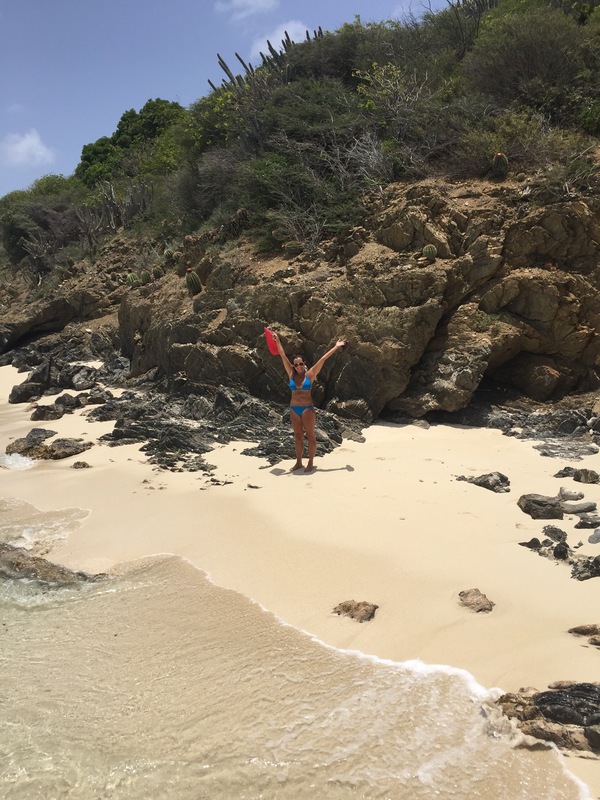 This entry was posted in Virgin Islands_U.S and tagged buck islands, living on a boat, usvi u.s.virgin islands on June 24, 2017 by Christine. (Where you going?) was a frequently asked when Matt made a sudden turn down a dirt road and the answer was always “Me ain know mehson” (I don’t know) – exploring. Back in the jeep, we loaded our cooler and took off toward the west side of the island. I wanted to see the rain forest, so we took the smaller roads that led to dirt roads instead of the main highway. We managed to find the rain forest, which was amazing, with huge trees cresting over the roads, birds singing, and critters all over the place. 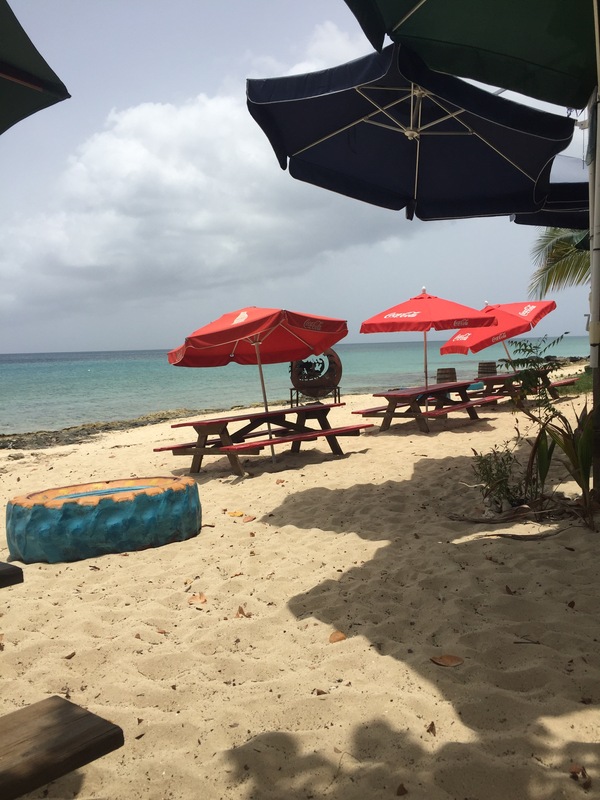 We only got “turned around” a few times and managed to find our way out to Frederiksted where we stopped at Freedom City Surf to catch some lunch. We shared Mahi Mahi Tacos and super tasty seasoned chicken tacos along with a giant ear of corn soaked in butter and cheese! Does life get much better? We explored the west side of the island which was lovely and ran along the coast, but there were not many places to stop. 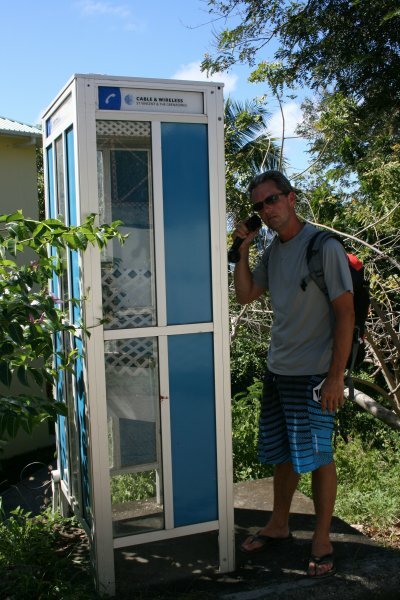 On our way to the north side of the island, we had to stop at the airport to clear out of the Virgin Islands. 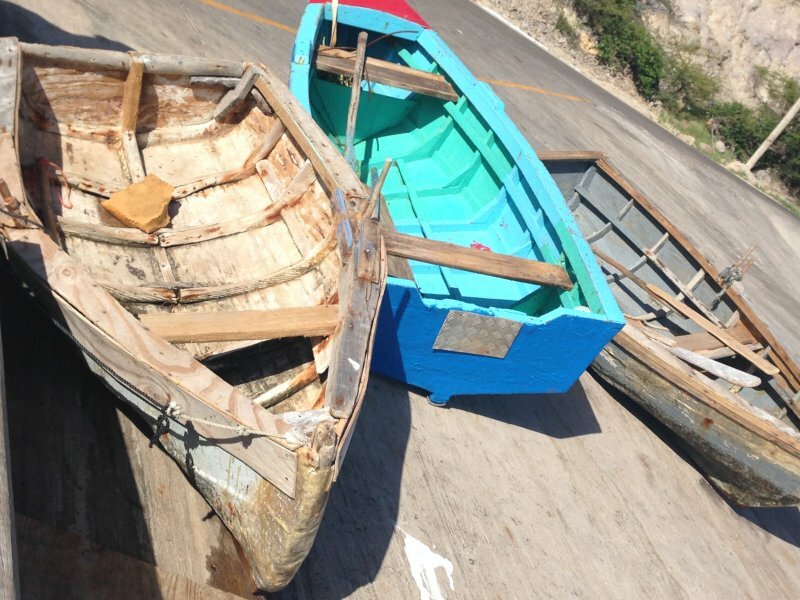 Technically, we did not have to clear out since we are U.S. citizens and the boat is registered in the U.S., but we needed to have exit paperwork in order to clear into Bonaire. After this little pit stop, we headed toward the north side. 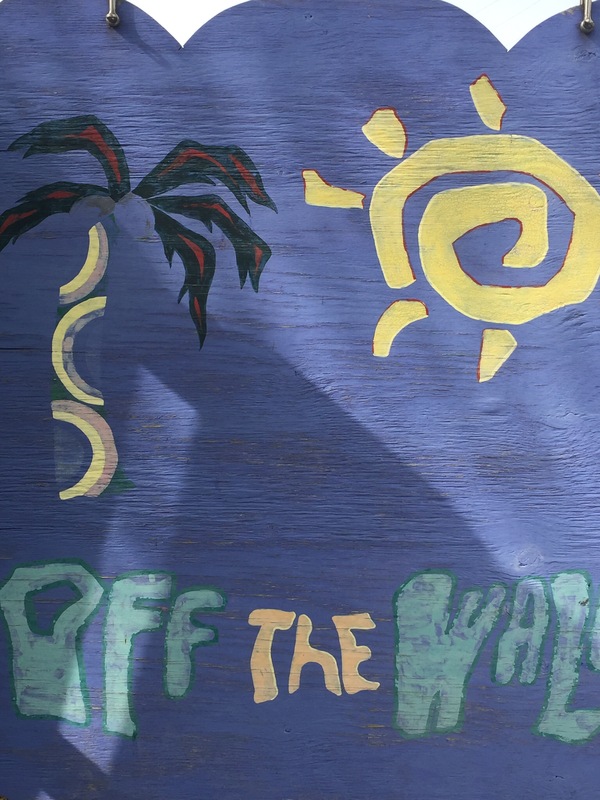 We visited Spratnet (different from the Spratnet in St. Kitts) and stopped in at Off the Wall. Both little bars are on the beach and have their own unique local vibe. 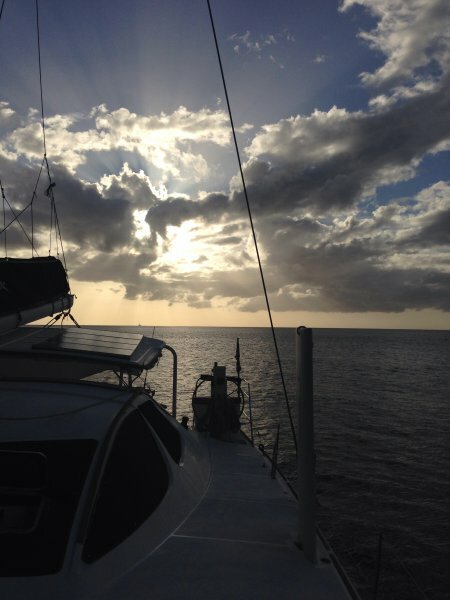 It was getting late and we had to feed the jeep and return her home – so we headed back to Christiansted. 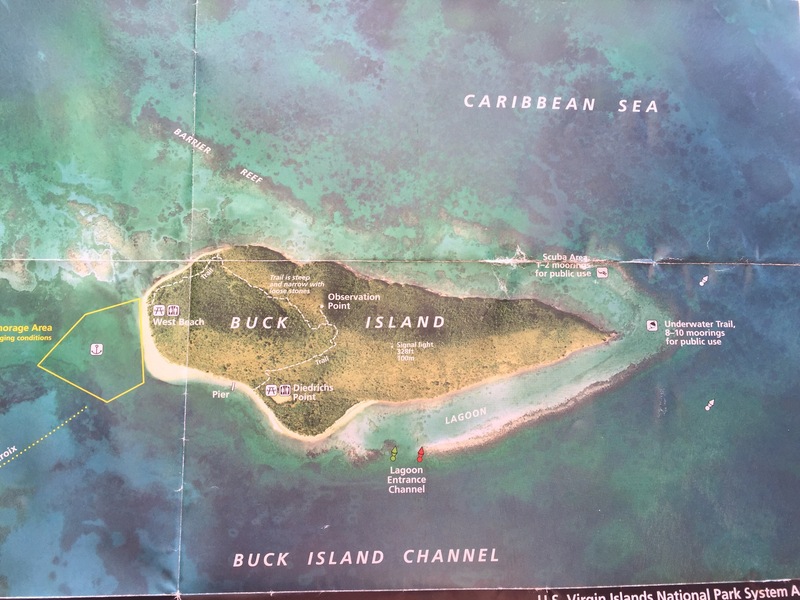 We had hoped to motor-sail over to Buck Island which is a 19,015-acre national park which is 6,000’ long, 2,500’ wide, rises 328’ above sea level and includes 176-acres of tropical dry forest and 18,839-acres of submerged land and coral reef system. As we were checking out the entry to this island, we discovered that you had to have a permit to take a private yacht there– yikes! So, we decided to get up early and head to the National Park center to try to obtain a permit in one day (even though it typically takes 3-5 days to issue a permit). 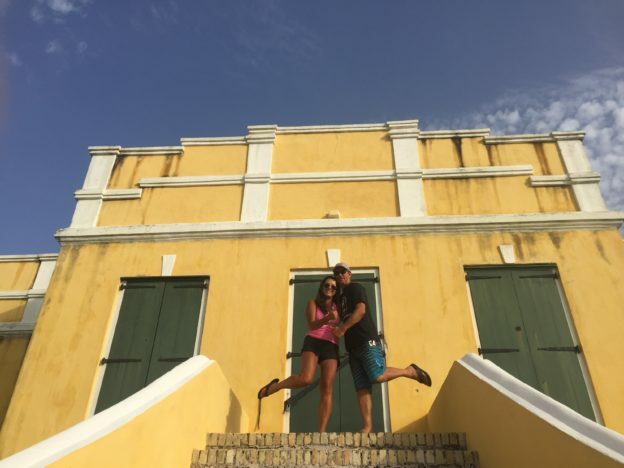 We submitted the application, the woman assured us it won’t take 3-5 days, but did not say anything about turning it around in one day so we decided to explore Christiansted on foot. First, we explored Fort Christiansvaern, which is a Historic Site commemorating urban colonial development of the Virgin Islands. It features 18th and 19th century structures in the heart of Christiansted, the capital of the former Danish West Indies on St. Croix Island. They have recreated old barracks, prison, dungeon, latrine, powder room, and artillery room. Pretty cool with impressive views of the bay. We then headed down their main street to check out the local wares. 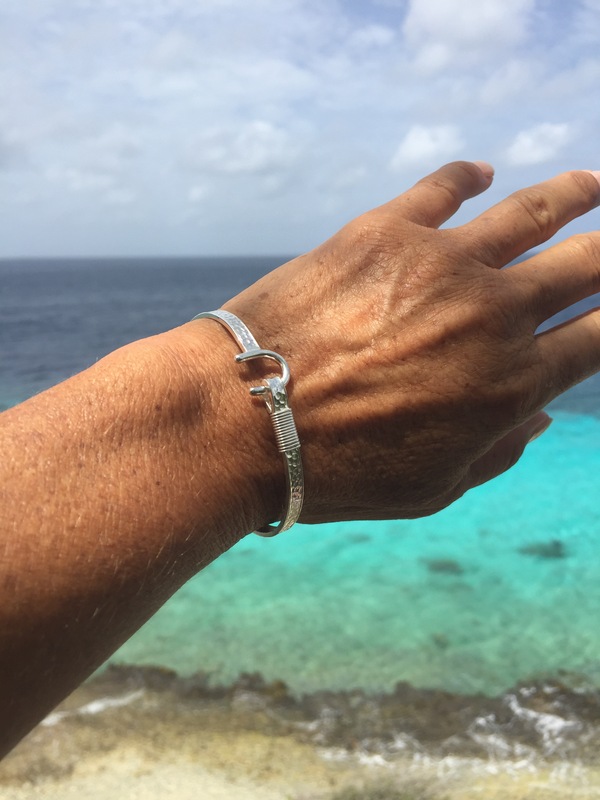 Of course, I had to purchase a hook bracelet which is a St. Croix symbol of friendship and love. Before heading back to the boat, we checked on our permit and a lovely lady hand walked it down to the police for us so that we could head to Buck island tomorrow! 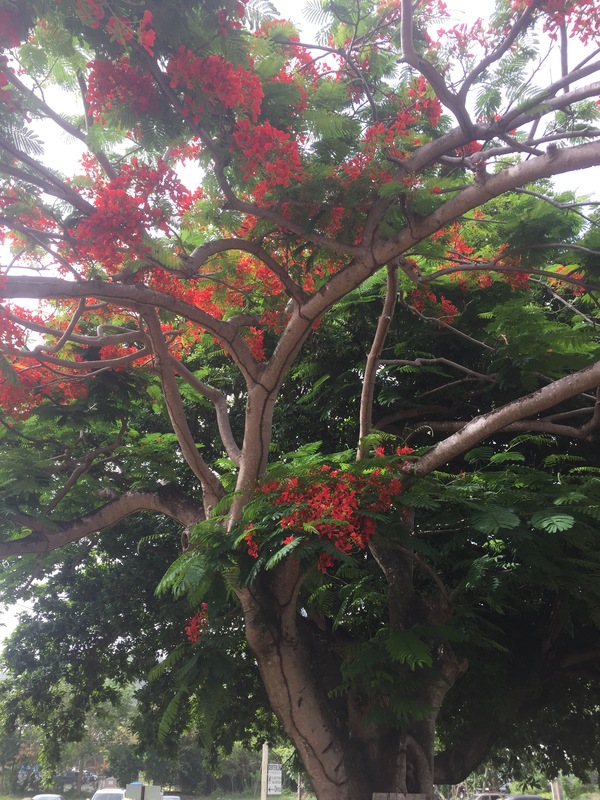 Vibrant red flowers blooming all over the island. 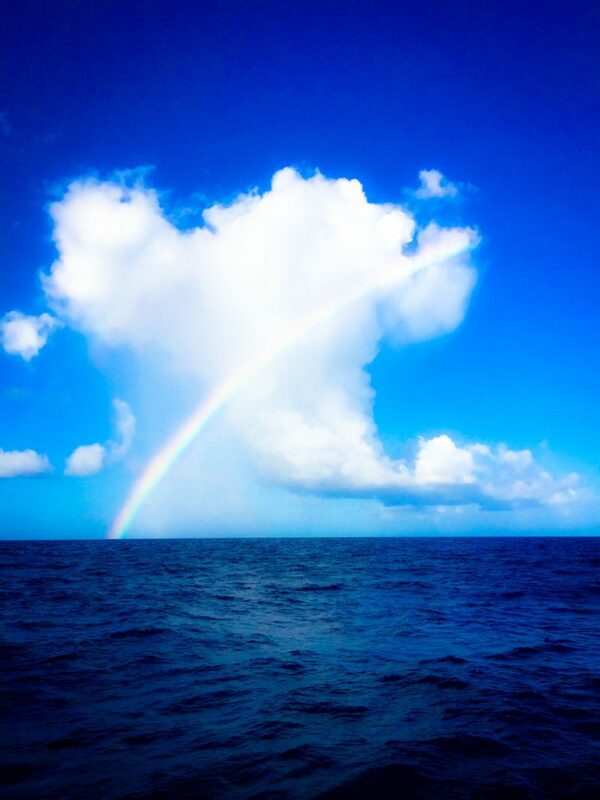 This entry was posted in Virgin Islands_U.S and tagged living on a boat, off the wall, spratnet, st. kitts, U.S. virgin islands, usvi on June 22, 2017 by Christine.